When you feel passionately about something or someone it is only natural to want to show it! The same goes for a die-hard Cowboys fan who decided to take his loyalty to the next level. 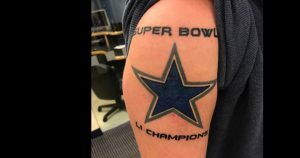 This young man with a Cowboys symbol and the words, ” Super Bowl 51 Champions “, tattooed on his arm is representing his favorite NFL team with pride but, what happens when the Cowboys don’t win the 51st Super Bowl? How about if they don’t even make it to the said, Super Bowl 51. That is exactly what happened! They were in the final playoffs and lost to Green Bay. 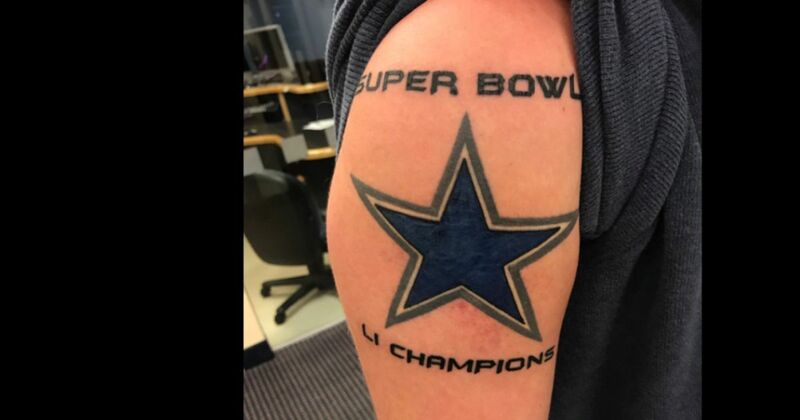 When asked what the stand up comedian would do about the tattoo, he said he could possibly remove it or add another 1 to the roman numeral symbol to make it for Super Bowl 52. (Of course in hopes they make it to Super Bowl 52). Although tattoo removal is definitely possible, it is not a quick fix solution. Specifically, for this gentlemen, the newness and the color of his tattoo pose for a more difficult removal. The newer the tattoo, typically the more treatments he will need. This process can take some time as well. You must wait 6 to 8 weeks in between laser tattoo removal treatments and to safely and effectively remove a tattoo it is important to let the skin heal in between each treatment. Also, color plays a big role in the removal process. The Cowboys color is a well-known blue. This color, along with a few others, such as green, yellow, and purple, are on the more difficult side to completely remove. The best option to turn these tattoos around would be a cover up. This tattoo would need to be lightened by a laser treatment to ensure a good cover up and to avoid the Cowboys tattoo showing through. These impulsive tattoos are not uncommon and thankfully laser tattoo removal is an option. If you or someone you know is living with a unwanted tattoo, then we can help. Previous Post New Year…New You!